Brad Bird writes and directs this animated adventure sequel featuring the voice talents of Holly Hunter, Craig T.
Nelson and Samuel L. Jackson. 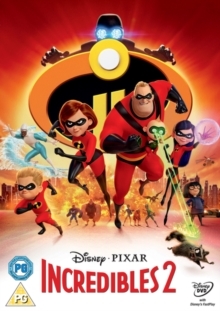 When his wife Helen (Hunter) is given a new job fighting crime in her guise as Elastigirl, Bob Parr (Nelson) is left at home to take care of the kids. Struggling to maintain order after discovering his youngest son has developed extremely potent superpowers, Bob is once again called on to take on his role as Mr. Incredible and join forces with Helen and best friend Frozone (Jackson) when a mysterious new supervillain begins causing havoc in the city.